You both have written a number of screen plays which have been produced by Believe Pictures. Was it much different for you two to purpose to write a book, rather than a screen play? Though a good story is at the heart of either format, the mechanics of telling the story are quite different. For instance, in a novel, you have unlimited time to go off on tangents and to explore in the internal thoughts of a character. Whereas a screenplay, you are limited to a hundred and twenty pages to tell your story which in some respects is more difficult to execute. There are also no budget constraints with writing a novel so the imagination is unhindered by logistics and cost issues associated with film or television. How do you think your past history of writing screen plays factored into writing a book? Over the years, we have formed a process that we were able to carry over from screenplay to novel. We are both very aware that neither one of us is a complete author. But when we combine our strengths, it works. Do you see The Silent Gift as being translated on film at some point in time? That is our desire. But it is partially contingent upon the success of the novel. How do you share the writing responsibilities (i.e., do you write in tandem, do you "clean up" each other's drafts)? As mentioned, we each bring different strengths to the table. Michael is all about character and story. (The novel was his original idea.) He lays out the scenes beat by beat. Cindy’s strength is description and she takes a first pass at the scene that Michael has layed out for her. Then Michael will take his pass at the scene. Once we have a first draft, then it becomes a process of both rewriting and rewriting and rewriting until we feel strongly that all elements are written to the best of our abilities. This book is a contrast to Oke's Love Comes Softly series. It definitely has a darker, more intense feel to it. What drew you to writing a story about the subject matter of prophetic gifts? We always respect the material that was granted to Michael, whether it be “Love Comes Softly” by Janette Oke or “The Last Sin Eater” by Francine Rivers, which for example was darker than Oke’s series of books. Michael was drawn to the subject matter of ‘can a gift from God be misused or abused?’ Prophecy became the gift that best suited the story. What about this period in history (the 1930's) drew you to that decade as the setting for your story? Have you received a significant response from the reading community, either positive or negative, following the books release? How do you hope that it impacts individual readers? The response from readers has been very positive! Most people seem to think the story is engaging from the first to the last page. There are many themes running through the book that we hope have an impact on the reader. For example, the theme of brokenness – both internal and external. Jack is an obvious example of external brokenness. He can neither hear nor speak. Mary is an example of someone hiding their external brokenness. Charles is both emotionally and spiritually broken which is internal. 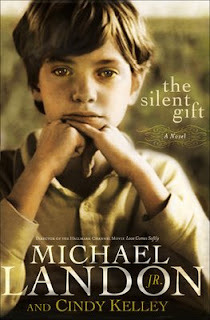 Again, I thought that The Silent Gift was one of the most compellingly interesting and entertaining books that I've read in some time. I'm STILL not exactly sure what I think of it in total. I do hope the book does well. I think it deserves to. Also, it is kind of interesting being able to ask authors questions about their books. I may do it again in the future. (It wasn't as scary a prospect as I thought.) I also don't think my questions were all that deep. But I was curious about these specific things, after having read the story, and it was nice to just be able to ask! You got to interview Michael Landon Jr.???? ?